Our tin and metals signs are top quality hand silk screened works of art manufactured by a small team of dedicated artists. The tin signs are heavy duty 24 gauge steel with corner holes for easy hanging. 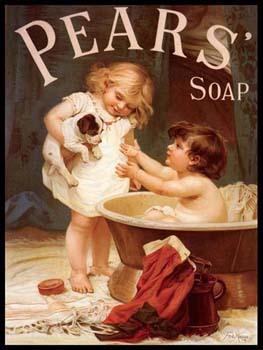 This "Pear's Soap" vintage sign is so cute in my bathroom. The colors are sharp and vivid. Sign is well made and without flaw. Package was well cushioned to prevent damage. Shipping was efficient. Our tin and metal signs are top quality hand silk screened works of art manufactured by a small team of dedicated artists. The tin signs are heavy duty 24 gauge steel with corner holes for easy hanging. Size: 16" x 12".